Report on the 23rd annual wine tasting presented by the Family Winemakers of California (FWC), on Saturday, August 17th and Sunday, August 18th 2013, at Fort Mason in San Francisco. The event focuses on current releases and soon-to-be-released wines from FWC members. The two-day event included a brief trade/media tasting followed by a public tasting on Saturday afternoon, and a trade/media tasting on Sunday afternoon. The notes below are from the Sunday portion of the event only. The Family Winemakers of California organization is a statewide trade association that was founded in 1991. From their mission statement, the FWC "advocates the rights and interests of its members to freely produce, market and sell their products, and is dedicated to preserving the diversity of California wine.” The organization works to influence public policy affecting wine producers in the state – they have been particularly active in trying to reform direct shipping laws. There are currently over 500 FWC members, most of which are smaller, family-owned wineries. FWC hosts three annual wine-tasting events, one in San Francisco, one in the Los Angeles area, and one in San Diego. The San Francisco FWC tasting is a huge event – over 220 wineries were represented in 2013, and this is probably the largest annual tasting of California wines anywhere. With over 50 of these wineries pouring there for the first time – the most new participants I’ve seen for this event – it’s a fine opportunity to check out some undiscovered vintners. This is always a highly-anticipated tasting, as the breadth and overall quality of producers participating there makes this the best all-around wine event in the San Francisco Bay Area. Not only do consumers get a chance to taste wines from all over the state and from dozens of grape varieties as well as interesting blends, but a number of top-notch producers who routinely pour at the FWC tasting are rarely seen at other public events. And for the wineries, this tasting probably draws more key wine trade attendees than any other event. I’ve noticed in recent years that many of the large wine tasting events seem to be losing participants to the smaller tastings that focus on specific regions, grape varieties, and wine styles. I got the sense that this is happening to the FWC tasting as well. Their website notes that the San Francisco tasting has hosted over 400 producers in the past so it has shrunk considerably – though one could argue that the current size is much more manageable to consumer and trade tasters than an event double the size. Due to a Saturday schedule conflict, I was able to attend just the Sunday tasting this year. Since the Sunday tasting this year was for trade/media only, the crowd at the large pavilion at Fort Mason did not completely pack the space. Few producers generated a lot of traffic in front of their tables, and in nearly all cases, it was only necessary to return a few minutes later in order to step right up for a pour. As usual, food tables were spread throughout the hall offering bread, crackers, and cubes of cheese, while a few other food purveyors were scattered among the winery tables. A number of other wine industry businesses had tables at the event as well. The FWC tasting continues to be a very well-run event and once again things went smoothly throughout, even down to the small details. This was the third year of take-away wine sales at the event. This allowed tasters to purchase wine right at the tasting and take it home with them, a great convenience for the public and an opportunity for wineries to gain new customers right on the spot. It looked like an increasing number of wineries were participating in the take-away sales program this year, and I imagine that this trend will continue in the future. 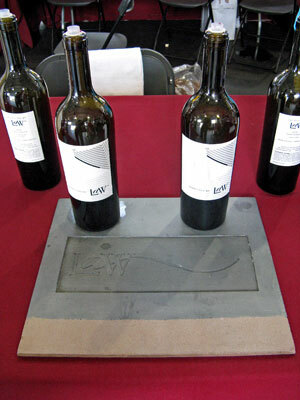 This was the second year of the “iSip Lounge” – a Saturday afternoon specially-ticketed tasting located in the mezzanine level at the rear of Fort Mason’s Festival Hall. This year’s iSip Lounge tasting featured single bottlings priced at $75 and up (the highest-priced wine listed was $150) from a variety of producers – a somewhat different format than last year’s. The wine line-up featured there changed over the course of the afternoon. But alas, I was not able to make it to the Saturday tasting so I missed out on this year’s iSip Lounge. Since I only had a single tasting session this year, I did not follow my usual strategy of trying to taste lighter wines the first day and bigger ones the next. And I did not try to taste whites and Rosés separately from reds – I just tasted table by table. Some producers poured only one or two different wines, while others had as many as a dozen to sample. I tried to limit myself to no more than 4-5 wines at each table. I’d spent quite awhile studying the tasting information that was available on the FWC website in advance of the tasting – they do a great job of organizing this information in a way that makes planning a tasting strategy easy. I had listed a number of producers I’d hoped to visit this year, but there’s never enough time to taste at every winery table I would have liked to. I always try to check out a number of wineries that are either new to me or with which I have very little experience – some of these I plan to visit in advance and others are ones that generate some buzz at the tasting. But due to my more limited time this year, those producers made up a smaller percentage of my tastings than usual. I do enjoy returning to past favorites, especially those whose wines I may only taste at this one event each year. As I had tasted quite a few Chardonnays and Pinot Noirs in the past few months, I decided to focus more on other varieties this time. And I passed on tasting at the tables of a number of producers whose wines I had tried earlier this year – Bailiwick, Benovia, Cain, Dancing Coyote, Handley, Hilliard Bruce, Kenneth Volk, Martian Ranch, Navarro, and Pierce Ranch among them. With other producers where I had tasted earlier this year, I tried to stick with wines I hadn’t tried before. But there are always a few repeat wines along the way, and as I often find at events such as these, there were some wines at this year’s tasting that were the same ones poured last year. And every year, I find that there are some favorite producers from past years who are missing – Calera stood out to me in that respect this year but there were others as well. I tasted current release vintages ranging mostly from 2009 to 2012, along with a handful of earlier vintages. Looking at the list of Favorites, well over half of the reds are from 2010, as that vintage seemed to be showing very well at this tasting, and in general it seems to be a vintage that is drinking well at an early stage. Although 2011 is likely to be more hit and miss due to the unusually cool growing season and rains during harvest, I believe we’ll still see plenty of excellent 2011 wines, but based on what I’ve been tasting, most will take longer to start showing their best. Favorite wine line-ups this year included those from Herb Lamb, Kaena, Lagier Meredith / Chester’s Anvil, and Tablas Creek, while Arrow & Branch, Parallel, Presqu’ile, Ramey, Sojourn, and Vellum were among those who presented strong line-ups as well. Paloma, with its single wine on display, was also outstanding. The list of Favorites this year includes some familiar names from past FWC tastings as well as some newcomers. Just missing the Favorites list were wines from Chateau Montelena, Derby, Fort Ross, and Westerhold as well as additional wines from Dashe, Frostwatch, Ramey, Sojourn, Tablas Creek, and Vellum. I found that I preferred some “second label” wines from well-known producers to their regular wines. There were plenty of standout wines this year, though with just one day rather than my usual two days to sample from such a large number of producers, it’s tough for me to say whether the overall level of quality at this FWC tasting was better than last year or not. No other event offers such a broad look at current releases from wineries throughout the state, from both highly-acclaimed veterans and little-known newcomers. Even with more and more small wine tasting events seeming to draw producers away from the larger ones, the annual Family Winemakers of California tasting remains the finest opportunity to taste the tremendous variety of wines that California has to offer. Arrow & Branch 2012 Sauvignon Blanc, Napa Valley. From 27% Musque clone, made in 45% neutral oak, 29% new oak, and 26% stainless steel. Very light color, this displayed aromas of grapefruit and stone fruit, fresh herbs, and a hint of sweet oak. Moderately rich mouthfeel, with a long, smooth finish. Arrow & Branch 2010 Red Wine, Napa Valley. 60% Cabernet Franc, 26% Merlot, 8% Cabernet Sauvignon, 5% Petit Verdot, 1% Malbec, from the estate and Stagecoach vineyards, aged 20 months in 65% new French oak. Medium-dark purple color, featuring upfront herbal notes along with currant and plum fruit, black pepper, baking spices, and vanilla/oak on the nose. Medium-bodied with a lively texture and refined tannins on the finish, nice. Arrow & Branch 2010 Cabernet Sauvignon, Napa Valley. 93% Cabernet Sauvignon, 4% Merlot, 3% Cabernet Franc, not yet released. Dark color, with a riper and darker fruit profile, along with mocha, spice, and oak notes. Richer on the palate, with a big, grippy tannic finish. Comments: Winery proprietors Steve and Seanne Contursi launched Arrow & Branch in 2007, with 2008 being their first vintage. The estate vineyard in Coombsville was first planted in 1991. 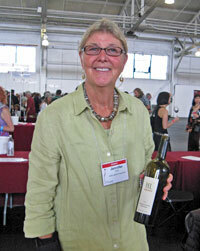 Helen Keplinger was the label’s first winemaker, and Jennifer Williams took over from her in 2011. 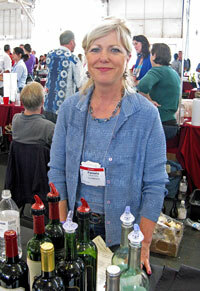 Pamela Jessup-Carter poured the wines at the tasting. Bravium 2012 Chardonnay, Abbassi Vineyard, Carneros. Light color, this featured leesy apple and pear fruit and spice on the nose. Medium-light weight with a lively texture and crisp finish. Red 7 2010 “Proprietary Red Wine,” North Coast. 34% Merlot, 29% Pinot Noir, 12% Barbera, 10% Zinfandel, 7% Cabernet Sauvignon, 7% Syrah, 1% Petit Verdot. Medium purple color, showing black cherry and plum fruit, touches of black pepper and spice, and a dash of sweet oak. Medium-bodied with good acidity and fairly mild tannins. Lucky NV “Lucky II Proprietary Red Wine,” California. 55% Zinfandel, 27% Petite Sirah, 11% Merlot, 7% Cabernet Sauvignon, from the 2009 and 2010 vintages. Medium color, this had more upfront spice notes along with a darker fruit profile than the previous wine. Richer mouthfeel with a more grippy tannic finish. Outlier 2012 Pinot Noir, North Coast. Sourced from 52% Seppa (Petaluma Gap), 27% Signal Ridge (Mendocino Ridge), and 21% Beau Terroir (Carneros) vineyards. Medium-light ruby color, with spice, fresh herbs, cherry and rhubarb, and a touch of oak. Bright mouthfeel with a chalky, minerally finish, nice. Comments: Established in 2007, Bravium is the project of owner/winemaker Derek Rohlffs, who was behind the winery table at the tasting. Derek has created several other brands in addition to the flagship Bravium label, and he poured wines from a number of them. The winery is located on Treasure Island in San Francisco Bay. Mahoney 2012 Vermentino, Las Brisas Vineyard, Carneros. Very light straw color, with bright apple and pear aromas, fresh herbs, and a slightly stony mineral note. Medium-light bodied with juicy acidity and a long, clean finish, nice. Mahoney 2010 Albariño, Las Brisas Vineyard, Carneros. Light straw color, with riper apple, herb, and lees on the nose. Medium weight with a richer mouthfeel and smooth finish. Mahoney 2010 Sangiovese, Las Brisas Vineyard, Carneros. Medium ruby color, displaying earthy black cherry, dried herbs, and a touch of black pepper. Medium-bodied with bright acidity and a lively finish. Comments: Carneros Wine Company includes the Mahoney Vineyards and Fleur de California labels, both from longtime Carneros vintner Francis Mahoney and his wife Kathy. Francis owns and farms both the Las Brisas and Mahoney Ranch vineyards, located at opposite ends of the Carneros AVA. Ken Foster is the winemaker. I had tasted the Pinots recently so I skipped them at this event. Chateau Montelena 2012 Riesling, Potter Valley. Sourced from McFadden Vineyard. Light straw color, with ripe stone fruit and mildly floral aromas. Medium-light weight with a smooth mouthfeel and a hint of sweetness on the finish. Chateau Montelena 2010 Cabernet Sauvignon, Napa Valley. 91% Cabernet Sauvignon, 7% Merlot, 2% Petit Verdot, aged in French and Hungarian oak for 14 months. Medium purple color, this showed plum, currant and herb notes along with earth and lots of spice on the nose. Medium weight with a moderately rich texture and firm tannins. Chateau Montelena 2009 Cabernet Sauvignon, “The Montelena Estate,” Napa Valley. 98% Cabernet Sauvignon, 2% Cabernet Franc, aged for 22 months in French oak. Darker color, displaying more dried herb/tobacco character along with a darker fruit profile and an undercurrent of vanilla/oak. More structured in the mouth than the previous wine, finishing with fairly big but refined tannins – this could be quite good given more time to develop in the bottle. Comments: Chateau Montelena has a noted place in California wine history, with its 1973 Chardonnay being named the top Chard at the “Judgement of Paris” tasting in 1976. Originally founded in 1882, the winery closed due to Prohibition and did not begin production again until 1972. Cameron Parry currently makes the wines under the direction of Bo Barrett. Stepping Stone 2012 Rosé, “Corallina,” Napa Valley. From whole-cluster pressed Syrah. Light pink color with watermelon and spice on the nose. Lighter-bodied with a fairly smooth texture and finish. Stepping Stone 2011 “Red Rocks!,” Napa Valley. Value-priced red blend. Medium-dark color, this showed plummy fruit, earth, and spicy oak. Medium-bodied with a smooth mouthfeel and milder tannins. Stepping Stone 2010 Cabernet Franc, Napa Valley. Medium purple color, this had herbal aromas upfront, along with currant and darker fruit notes, and touches of black pepper and sweet oak. Medium-bodied with good structure and a lively mouthfeel, finishing with firm but moderate tannins, nice. Cornerstone 2009 Cabernet Sauvignon, Napa Valley. Sourced from three vineyards, 95% Cabernet Sauvignon, 5% Merlot. Medium-dark color, featuring plum and darker fruit, chocolate, tobacco, and vanilla/oak aromas. Fairly rich on the palate with big chewy tannins that will take time to resolve. Comments: Mike Dragutsky founded Cornerstone in 1991, and in 2008 he was joined by Craig Camp and Jeff Keene. Best-known for their fine Napa Valley Cabernets, Cornerstone has also made Willamette Valley Chardonnay and Pinot Noir in recent years. Stepping Stone is a second label for more value-priced wines. Dashe 2012 Dry Riesling, McFadden Farm, Potter Valley. Light straw color, this had bright stone fruit, pear, and earth aromas. Medium-bodied, this combined lively acidity with a fairly smooth texture and finish. Dashe 2012 Grenache, “Les Enfants Terribles,” Dry Creek Valley. 100% Grenache. Medium-light color, with raspberry and spice, and earth on the nose. Medium-light weight on the palate, with a bright mouthfeel and moderate tannins. Dashe 2012 Zinfandel, “Les Enfants Terribles,” Heart Arrow Ranch, Mendocino County. From a young, biodynamically-farmed vineyard. Medium-light color, featuring floral and black pepper aromas along with strawberry and raspberry fruit, plus earth and spice notes. Medium-light bodied with a lively texture and moderate tannins, nice. Dashe 2010 Zinfandel, Florence Vineyard, Dry Creek Valley. Medium color, this showed a more upfront plummy character, with spice, pepper, and sweet oak in support. Richer mouthfeel with a more firmly tannic finish, a tasty Zin should go nicely with barbecued meats. Comments: Founded in 1996 by Michael Dashe and his wife Anne, Dashe Cellars is located near Jack London Square in Oakland. Best-known for their fine Zinfandels, Dashe produces a number of other wines as well. Their “Les Enfants Terribles” wines are made from earlier-picked organic or biodynamic fruit, and use older oak barrels and little added sulfur. Michael poured his wines at the tasting. Derby 2010 “Implico,” Paso Robles. 50% Cabernet Sauvignon, 38% Merlot, 12% Petit Verdot, all from estate vineyards (Derby Vineyard and Laura’s Vineyard). Medium-dark purple color, this combined ripe plummy fruit with dried herb/tobacco, spice, and undertones of sweet oak. Medium-bodied with a moderately rich mouthfeel and somewhat grippy tannins that shows promise but could use a few years of bottle age to smooth out. Comments: Derby Wine Estates is owned by Ray and Pam Derby and established their winery in 2006. Steve Vierra manages the vineyards while his wife Tiffinee is the winemaker. I had tasted most of the Derby wines at other recent events so I limited my tasting to the new “Implico” release. Derby hospitality manager Katie Kanphantha was on hand to pour the wines. Fenestra 2012 “Semonnay,” Livermore Valley. 59% Chardonnay, 41% Semillon. Medium-light straw color, with apple and pear fruit, plus some spice and herb notes. Medium-light bodied with a slightly chalky texture and finish. Fenestra 2009 Mourvèdre, Estate, Livermore Valley. Sourced from the estate vineyard. Medium-light purple, this had lots of herbal aromas upfront along with black cherry, earth, and baking spices. Medium-light weight on the palate with fairly mild tannins. Fenestra 2010 Graciano, Lodi. Sourced from Bokisch Vineyard. Medium-dark purple color, displaying an earthier character, with dark berry fruit, dried herbs, and a hint of sweet oak. Medium-bodied with a round mouthfeel and moderately grippy tannic finish. Fenestra 2009 Malbec, Ghiemetti Vineyard, Livermore Valley. Dark color, this featured upfront tobacco/dried herb aromas plus dark fruit, smoke, and spice. More full-bodied with a lively texture and plenty of structure, finishing with firm but fine tannins, nice. vanilla/oak notes. Richer mouthfeel with a big, chewy finish. Comments: Lanny and Fran Replogle launched Fenestra in Livermore Valley in 1976, and as usual, Lanny was behind the winery table at the tasting. The winery produces a number of wines, mainly featuring those from Bordeaux, Rhône, and Iberian grape varieties. Their Tempranillo has been a favorite in the past, but this year I thought their Malbec was a standout. Wonderwall 2012 Pinot Noir, Spanish Springs Vineyard, Edna Valley. 100% whole-cluster fermented, bottled four days before the tasting. Lighter color, displaying ripe plum and raspberry aromas, some herbal/stemmy notes, and spice. Medium-light bodied with moderately grippy tannins on the finish. Almanac 2012 Zinfandel, Old Potrero Vineyard, Arroyo Grande Valley. 95% Zinfandel, 5% Mourvèdre, from 20-year old head-trained dry-farmed vines, aged in 25% new American oak. Medium purple color, with peppery plum and boysenberry fruit, baking spice, and undertones of vanilla/oak. Medium weight on the palate with lively acidity and moderate tannins, nice. Field Recordings 2011 “Chorus Effect,” Koligian Vineyard, Paso Robles. 31% Cabernet Sauvignon, 25% Cabernet Franc, 25% Petit Verdot, 19% Tannat, co-fermented and aged in 85% new French oak. Dark color, this had lots of upfront toasty oak along with dark berry fruit, spice, and dried herbs. Full-bodied with a fairly rich texture, this finished with chewy tannins. Comments: Andrew Jones established the Field Recordings label, with the first wines coming from the 2006 vintage. He’s followed with Fiction and other related labels in the years since. The wines are made in Paso Robles with fruit sourced from a number of Central Coast vineyards. I’ve particularly liked their Chenin Blanc in past years but they were not pouring it when I visited the table. I thought the tasty Almanac Zinfandel was a particularly-good value. Flanagan 2011 Chardonnay, Russian River Valley. Light straw color, with spiced apple and vanilla/oak on the nose. Medium weight on the palate, with a moderately creamy texture and smooth finish. Flanagan 2011 Pinot Noir, Russian River Valley. Medium-light color, showing somewhat higher-toned plum and black cherry fruit and spice. Medium-bodied with bright acidity, finishing with fairly mild tannins. Flanagan 2009 Cabernet Sauvignon, Bennett Valley. Barrel-aged for 44 months. Dark color, this was herbal and a bit earthy, with blueberry and darker fruits and smoky oak. Fairly big and rich, with a firm tannic finish. Flanagan 2011 Syrah, Bennett Valley. Barrel-fermented and aged for 18 months in new oak. Medium-dark color, with dark berry fruit, herbs, spicy oak, and a touch of pepper. Medium-full bodied with a lively mouthfeel, this finished with big, grippy tannins. Comments: Eric Flanagan launched his namesake winery in 2005, and owns estate vineyards in Russian River Valley and high in the hills above Bennett Valley. 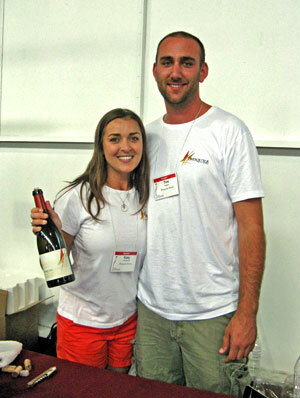 Mark Mazzoni and Erin Green head up the winemaking team. The Syrah was my favorite of the four wines I tasted. Fort Ross 2010 “Symposium,” Fort Ross Vineyard, Sonoma Coast. Mostly Pinot Noir with about 3-4% Pinotage, 30% new oak. Medium ruby color, showing red fruits, earth, and smoky oak on the nose. Medium-bodied with a lively texture and moderate tannins. Fort Ross 2007 Pinotage, Fort Ross Vineyard, Sonoma Coast. Medium color, this was very earthy with a strong herbal character, along with plummy fruit. Bigger on the palate than the previous wine, with a grippy tannic finish. Fort Ross 2009 Pinot Noir, Fort Ross Vineyard, Sonoma Coast. Medium-light color, with red fruits, spice, sweet oak, and lots of black pepper. Lively mouthfeel with fine tannins and a lingering finish, nice. Fort Ross 2007 Pinot Noir, “Reserve,” Fort Ross Vineyard, Sonoma Coast. Includes Calera, Swan, Hyde, Pommard, 115, and 777 clones. Slightly darker garnet color, this displayed earthy black cherry, spice, and vanilla/oak aromas. Richer than the previous Pinot, with a firmer tannic finish. Fort Ross 2011 Chardonnay, Fort Ross Vineyard, Fort Ross-Seaview. Very light color, citrus and pear fruit plus spice and lees notes. Medium-light bodied with a lively mouthfeel and finish. Fort Ross 2005 Chardonnay, “Reserve,” Fort Ross Vineyard, Sonoma Coast. Medium-light yellow color, this showed more spice and vanilla/oak on the nose, along with pear and stone fruit. Richer, creamier texture than the previous wine, with a long, smooth finish. Comments: Lester and Linda Schwartz began developing their vineyard, above the fog line along the Sonoma Coast, in 1994. The Estate vineyard is within the new Fort Ross-Seaview AVA, approved in late 2011. Originally from South Africa, the Schwartzes have one of the few Pinotage plantings in California. 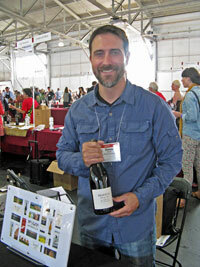 Jeff Pisoni has made the Fort Ross wines since 2009. Frostwatch 2012 “Kismet,” Bennett Valley. 86% Sauvignon Blanc, 14% Semillon, whole-cluster pressed and made mostly in stainless steel. Light straw color, featuring lemon, pear, and fresh herb aromas. Medium weight and lively on the palate, this had a chalky, minerally note on the long finish, nice. Frostwatch 2011 Chardonnay, Bennett Valley. Aged on the lees, about 25% new oak. Light color, this had a toasty character plus apple and citrus, lees, and spice. Medium-bodied with a moderately rich mouthfeel and finish. Frostwatch 2011 Pinot Noir, Bennett Valley. Medium-light ruby color, with bright red fruits, herbs, and a touch of sweet oak. Medium-bodied with juicy acidity, this finished with fine tannins. Shows promise but needs more time to develop. Comments: Frostwatch proprietors Brett Raven and Diane Kleinecke first planted their Estate Bennett Valley vineyard in the mid-1990s, but sold fruit to other producers for much of the next 12 years. They now produce their own wines, which Brett – formerly at Ramey – makes at the Vinify facility in Santa Rosa. As usual, Brett was behind the table at the tasting, and I continue to be impressed by the Frostwatch wines. Two Old Dogs 2012 Sauvignon Blanc, Napa Valley. From ? each 376, 530, and Sauvignon Musque clones, made entirely in stainless steel. Very light color, this showed good balance of grapefruit and herb aromas, along with mildly floral notes. Lighter-bodied and lively on the palate, with a crisp finish, nice. Two Old Dogs 2010 Cabernet Sauvignon, Napa Valley. From a cooler part of the vineyard, aged in 50% new French oak. Medium-dark color, with dried herb/tobacco notes upfront, supported by currant and plum fruit, spice, and sweet oak. Medium-bodied with good structure and firm but fine tannins on the finish, nice. Herb Lamb 2010 Cabernet Sauvignon, Napa Valley. From a warmer part of the vineyard, aged in 80% new French oak. Darker purple color, featuring a darker and riper fruit profile, coffee/mocha, spice, and a less apparent herbal component. Bigger and richer on the palate, with a grippy tannic finish that will need bottle age to smooth out. Comments: Herb and Jennifer Lamb’s five-acre vineyard was first planted in the late 1980s, and it became the source for highly-regarded wines from several producers. 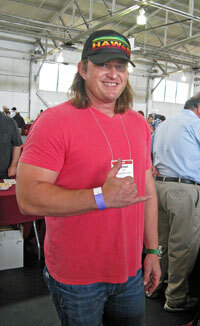 The Lambs launched their own label in 1997, and noted vintner Michael Trujillo has been the winemaker from the start. Two Old Dogs is a second label, and both Cabernets I tasted are 100% varietal and sourced entirely from the Estate vineyard. Jennifer Lamb was on hand to pour the wines. Kaena 2011 “Hapa Blanc,” Santa Ynez Valley. 84% Grenache Blanc, 16% Roussanne. Light straw color, this displayed apple and pear fruit plus an intriguing petrol note I sometimes find in Grenache Blanc. Medium-bodied with a slightly chalky mineral texture and a lively finish, nice. Kaena 2012 Grenache Rosé, Santa Ynez Valley. 100% Grenache, with ? made in older oak and ? in stainless steel. Light salmon-pink color, with bright strawberry, fresh herbs, and a touch of spice on the nose. Medium-light weight with a juicy mouthfeel and a hint of chalky tannins on the finish, nice. Kaena 2010 Grenache, Santa Ynez Valley. Sourced from four vineyards. Medium-light color, showing red fruit, spice, and undertones of sweet oak. Medium-light bodied with a fairly smooth texture and moderate tannins. Kaena 2010 Grenache, Tierra Alta Vineyard, Santa Ynez Valley. Medium-light garnet color, featuring brighter and slightly higher-toned strawberry and cherry, with lots of spice and hints of dried herbs. Bigger and more structured on the palate than the previous wine, with firm tannins – this is already showing nicely but could use more time in the cellar. Kaena 2010 Grenache, Larner Vineyard, Santa Ynez Valley. Medium color, with a darker fruit profile along with baking spice and vanilla/oak. Medium-full bodied with a rounder texture and big, broad tannins on the finish. Kaena 2010 “Hapa,” Santa Ynez Valley. 50% Syrah, 38% Grenache, 12% Mourvèdre. Medium-dark color, this had somewhat funky, earthy aromas upfront, with plum and darker berry fruit and herbs in support. Big and fairly rich mouthfeel with grippy tannins. Kaena 2011 Syrah, “Tenth Anniversary,” Tierra Alta Vineyard, Santa Ynez Valley. Poured from magnum. Dark purple color, this featured a more savory character, with herbs, a stony mineral element, and pepper along with black fruits on the nose. Rich but lively on the palate, with refined tannins and a long finish, nice. Comments: Kaena is the label of Beckmen winemaker Mikael Sigouin, who grew up in Hawai’i. He started Kaena in 2001, and the wines focus on Grenache and other Rhône grape varieties. The vineyard sources are mostly in the Ballard Canyon area of western Santa Ynez Valley – and Mikael told me at the tasting that Ballard Canyon has just been approved as a new AVA. Mikael presented a strong group of wines at the event. Chester’s Anvil 2010 Gewürztraminer, Mendocino. Very light straw color, with aromas of pear, grapefruit, and flowers. Medium-light bodied with a fairly smooth and clean finish. Lagier Meredith 2012 Rosé, Mount Veeder, Napa Valley. From 70% whole-cluster pressed Syrah, plus saignée from Zinfandel and Mondeuse. Very light pink, this showed bright watermelon and herb notes on the nose. Light and crisp, this finished with a touch of tannin, nice. Chester’s Anvil 2010 Malbec, Mount Veeder, Napa Valley. 100% Malbec, from Brandlin Ranch. Dark purple color, displaying plum and blueberry, tobacco/dried herbs, with a stony mineral element. Big but lively in the mouth, finishing with firm tannins. This has potential but still needs time. Lagier Meredith 2011 Tribidrag, Mount Veeder, Napa Valley. Tribidrag is an old Croatian name for the grape we know in California as Zinfandel. Medium-light purple, bright and brambly “Zinny” raspberry and plum fruit, spice, and a touch of black pepper. Medium-bodied with a bright mouthfeel and chalky tannins on the finish, a very nice and distinctive rendition of Zinfandel. Lagier Meredith 2010 Syrah, Mount Veeder, Napa Valley. Dark color, this featured black fruits, a savory, meaty component, plus spice and pepper notes. Big and structured, with grippy tannins and a long finish, this seems more in need of time in the cellar than most young LM Syrahs but should be outstanding. Comments: Steve Lagier and Carole Meredith first planted Syrah high on Mount Veeder above Napa Valley in 1994, and their first commercial release was in 1998. They’ve added Mondeuse, Zinfandel, and Malbec to their estate vineyard in recent years. Steve and Carole also poured their Chester’s Anvil wines – that label is a collaboration with their neighbors Aaron & Claire Pott of Pott Wine. Once again, this was an impressive line-up of wines. Law 2010 “Beguiling,” Paso Robles. 94% Grenache, 6% Syrah. Medium-dark color, with black cherry and plum, spice, and chocolate aromas. Medium weight with a lively texture and moderate tannins on the finish. Law 2010 “Audacious,” Paso Robles. 44% Grenache, 26% Cabernet Sauvignon, 20% Syrah, 10% Petit Sirah. Darker color, with a more herbal profile along with darker fruit, spice, and vanilla/oak. Medium-bodied and fairly rich in the mouth, with moderately grippy tannins. Law 2010 “Sagacious,” Paso Robles. 44% Grenache, 42% Syrah, 14% Mourvèdre. Dark color, with herbs, earth, dark berry fruit, and touches of flowers and sweet oak. Medium-bodied with good structure and a livelier mouthfeel, finishing with firm tannins, nice. Law 2010 “Intrepid,” Paso Robles. 100% Syrah, fermented in large-format French oak cooperage, aged in barriques. Dark color, with riper plum and darker fruit, mocha, and spice on the nose. Richer on the palate, with a big, chewy tannic finish. Comments: Don and Susie Law planted their estate vineyard on the Westside of Paso Robles in 2008. The vineyard includes Grenache, Syrah, Mourvèdre, Petite Sirah, Cabernet Sauvignon, Petit Verdot, Carignane, and Tempranillo. The 2010 wines are the label’s first releases, and all are from Estate fruit. The wines are made by Torrin’s Scott Hawley and feature the big, bold Paso style of Rhône reds. Paloma 2010 Merlot, Spring Mountain District, Napa Valley. About 15% Cabernet Sauvignon, aged in about 33% new French oak. Medium-dark color, featuring black cherry and herb aromas, along with spice, earth, and sweet oak. Medium-bodied with a balance of richness and structure, and firm but refined tannins on the lingering finish, nice. Comments: Paloma Vineyard, over 2,000 feet high in the Spring Mountain area, has produced consistently fine Merlots over the years. Jim and Barbara Richards planted the vineyard in the mid-1980s, and the Paloma label’s first wines appeared in the mid-1990s. As usual, Barbara and her son Sheldon, who makes the wine, were on hand to pour their Merlot – it’s always a highlight of the FWC tasting. Parallel 2009 Cabernet Sauvignon, Napa Valley. 95% Cabernet Sauvignon, 4% Merlot, 1% Cabernet Franc, sourced from five vineyards in Mt. Veeder, Howell Mountain, Spring Mountain, Conn Valley, and Coombsville. Medium-dark purple, with plum, spice, tobacco, and vanilla/oak aromas. Medium-full bodied with fairly big but fine tannins. Parallel 2009 Cabernet Sauvignon, “Black Diamonds,” Estate, Napa Valley. 100% Cabernet Sauvignon. Medium-dark color, with a darker fruit profile plus dried herbs, earth, and a stony mineral component along with a background of sweet oak. Richer mouthfeel but well-structured, with big but refined tannins on the long and lively finish, nice. Comments: Established by a group of friends from Park City, Utah, Parallel specializes in Napa Valley Cabernet and Chardonnay. The first release came in 2003, and the wines are made by noted winemaker Philippe Melka. The Estate vineyard is located in the upper part of Conn Valley. 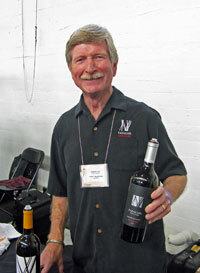 Mac MacQuoid, one of the winery owners, poured the Parallel wines at the event, and both Cabs were very good. Presqu’ile 2012 Sauvignon Blanc, Santa Maria Valley. Sourced from 90% Estate fruit and 10% Riverbench Vineyard, aged 7 months in neutral oak. Light color, this showed classic grapefruit and herb aromas. Medium-light bodied with a lively texture and clean finish, nice. Presqu’ile 2011 Chardonnay, Santa Maria Valley. Sourced from 70% Presqu’ile Vineyard and 30% Solomon Hills Vineyard, made in neutral oak. Light color, with leesy citrus and apple notes plus a touch of spice. Medium weight on the palate with good acidity and a smooth finish. Presqu’ile 2011 Pinot Noir, Santa Maria Valley. Sourced from 40% Presqu’ile Vineyard and 60% Solomon Hills, fermented in concrete, stainless steel, and oak, aged in 25% new French oak. Medium-light ruby color, featuring red fruit, spice, and hints of black pepper and sweet oak. Medium-bodied with lively acidity and a chalky, minerally texture on the finish. Presqu’ile 2010 Pinot Noir, Estate Vineyard, Santa Maria Valley. Made with 100% whole-cluster fermentation, aged 17 months in 35% new oak. Medium-light color, showing some stemmy/herbal character but well-integrated with the bright black cherry and plum fruit, baking spice, earth, and oak aromas, plus a hint of flowers. Medium-bodied and more structured than the previous wine, with firmer tannins on the finish. Tasty now but should improve with time in the cellar, nice. Comments: Owned by the Murphy family, Presqu’ile was established in 2007, with Matt Murphy being the public face of the winery. Their Estate vineyard in Santa Maria Valley was planted in 2008, mostly with Chardonnay, Sauvignon Blanc, Pinot Noir, and Syrah. Dieter Cronje is the winemaker, and a new winery was completed earlier this year. Katy Westgaard and Tim Rogers poured a very good group of wines from Presqu’ile at the tasting. Ramey 2011 Claret, Napa Valley. 61% Cabernet Sauvignon, 15% Merlot, 12% Petit Verdot, 10% Syrah, 2% Cabernet Franc, aged 12 months in 25% new oak. Medium-dark color, this displayed currant, dried herb/tobacco, flowers, spice, and undertones of vanilla/oak on the nose. Medium-full bodied with a lively texture and good structure, finishing with moderate tannins, nice. Ramey 2010 Cabernet Sauvignon, Napa Valley. 100% Cabernet Sauvignon sourced from 40% St. Helena, 30% Oak Knoll, 15% Yountville, 10% Diamond Mountain, 4% Rutherford, and 1% Mt. Veeder, aged in 67% new French and American oak. Darker color, with more upfront ripe plum and darker fruit, spice, mocha, and vanilla aromas. Richer mouthfeel with a grippier tannic finish. Ramey 2010 Syrah, Sonoma Coast. Sourced from 78% Shanel Vineyard, 16% Cole Creek Vineyard, and 6% Rodgers Creek Vineyard, fermented with 25% whole clusters and co-fermented with 5% Viognier, aged over two years in 50% new French oak. Dark color, this had an herbal and savory character, along with blackberry, spice, black pepper, and sweet oak. Medium-bodied and structured, finishing with big, chewy tannins, and should be good with a few years of bottle age. Comments: David Ramey and his wife Carla founded the winery in 1996, and David and Cameron Frey head up the winemaking team there. I had tasted some of the Ramey Chardonnays recently so I focused on their reds. The Rodgers Creek Vineyard Syrah has been a favorite in past years, but they were not pouring it at the table when I stopped by. The Claret was quite good and my favorite of these three wines. Sojourn 2010 Cabernet Sauvignon, Spring Mountain District, Napa Valley. 100% Cabernet Sauvignon clone 7 from Wurtele Vineyard, aged in 75% new oak. Medium-dark color, with currant and darker fruit, dried herbs, mocha, and spice aromas. Fairly rich but lively texture with good structure and refined tannins on the finish, nice. Sojourn 2010 Cabernet Sauvignon, “Proprietary Cuvée,” Napa Valley. 100% Cabernet Sauvignon, sourced from about 50% each Beckstoffer Georges III Vineyard and Wurtele Vineyard on Spring Mountain, aged in 75% new oak. Dark color, this showed a riper and darker fruit profile, less of an herbal note, and more spice and vanilla/oak on the nose. Full-bodied and rich, with firm, mouth-coating tannins on the long finish. Comments: Sojourn was formed in 2001 by Craig Haserot and Erich Bradley, and the label specializes in Chardonnay, Pinot Noir, and Cabernet Sauvignon. I had tasted several of the Pinots at another recent event so I stuck to their Cabernets this time. Both were good, with the Spring Mountain bottling being a particular standout. Tablas Creek 2011 “Côtes de Tablas Blanc,” Estate, Paso Robles. 27% Viognier, 26% Grenache Blanc, 25% Marsanne, 22% Roussanne (less Viognier and more Marsanne and Roussanne than in past years), fermented in stainless steel. Light straw color, this showed floral notes along with pear, stone fruit, and lees aromas. Medium-light bodied with bright acidity and a fresh finish, nice. Tablas Creek 2011 “Esprit de Tablas Blanc,” Estate, Paso Robles. 64% Roussanne, 26% Grenache Blanc, 10% Picpoul Blanc, made in both stainless steel and oak. Medium-light color, this was less fruit-forward, with earth, spice, pear, and a stony mineral note on the nose. Richer on the palate but with fine balancing acidity and a long finish, nice. Tablas Creek 2012 Vermentino, Estate, Paso Robles. 100% Vermentino, fermented in stainless steel. Very light color, displaying apple and herb aromas along with hints of earth and spice. Medium-bodied with a juicy mouthfeel and clean, crisp finish. Tablas Creek 2011 “Côtes de Tablas,” Estate, Paso Robles. 49% Grenache, 28% Syrah, 15% Mourvèdre, 8% Counoise, aged in 1,200-gallon foudres. Medium-light purple, with bright strawberry, herb, and earth aromas. Medium weight with a lively texture and moderate tannins on the lively finish. Tablas Creek 2011, Mourvèdre, Estate, Paso Robles. 100% Mourvèdre, aged in 1,200-gallon foudres. Medium purple color, this featured a more herbal character along with plum and black cherry fruit, spice, and earth. Somewhat bigger on the palate with plenty of structure and a grippy tannic finish, this is tasty now despite the tannins, and should improve with time in the cellar. Comments: Tablas Creek is co-owned by the Perrin family (of Château de Beaucastel fame) and Robert Haas (founder of Vineyard Brands importers). Their estate vineyard on the Westside of Paso Robles was first planted in the early 1990s. Darren Delmore was behind the Tablas Creek table, and I tasted through many of their wines, which were impressive as usual. Vellum 2012 “White,” Napa Valley. 80% Sauvignon Blanc, 20% Semillon, co-fermented in neutral oak, on lees for five months. Very light color, displaying citrus and pear, herb, and lees aromas. Medium-bodied with a moderately rich, chalky texture and fine acidity, and a long, clean finish, nice. 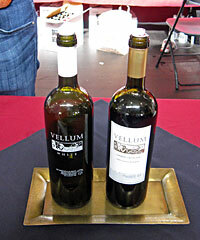 Vellum 2009 Cabernet Sauvignon, Napa Valley. 80% Cabernet Sauvignon, 10% Petit Verdot, 10% Merlot, about 55% new oak. Medium-dark purple color, this had currant and darker fruit aromas, along with herbs, smoky oak, and spice. Medium-bodied with a lively texture and moderate tannins, nice. Comments: Proprietor Jeff Mathy again poured the Vellum wines at the FWC tasting. Jeff and Karl Lehmann established the label in 2006, and they have been aiming for an “old school” Napa style with their Bordeaux-variety wines. I’ve been impressed by their reds in past years, and although this one was very good, I thought the white was even better. Westerhold 2011 Pinot Noir, Bennett Valley. First Pinot release from the Estate vineyard, with 115, 667, and 777 clones, aged 14 months in 100% new French oak. Medium-light color, with bright red fruits, herbs, and vanilla/oak aromas. Medium-bodied and lively, with moderate tannins on the finish. Westerhold 2009 Syrah, Bennett Valley. From Alban 1 clone, aged 16 months in 100% new French oak. Medium purple color, with herbal dark fruits, black pepper, spice, and sweet oak. Rich and structured on the palate, finishing with fairly big tannins – an intriguing bigger-style Syrah from a cool-climate vineyard. Westerhold 2008 Syrah, “Extended Barrel Aged,” Bennett Valley. A separate bottling from the regular 2008 Syrah, this was aged for 39 months in 100% new French oak. Medium-dark color, more fruit-forward than the previous wine, along with mocha, earth, spice, and vanilla/oak. Full-bodied and rich, this had big but refined tannins on the finish. Comments: The first Westerhold release was a Syrah from 2007, and that variety has been their sole focus until the new release of Pinot Noir. The Westerholds’ Estate vineyard in Bennett Valley is planted to Syrah plus three acres of Pinot that were added in 2008. Noted vintner Russell Bevan has made the wines from the start. 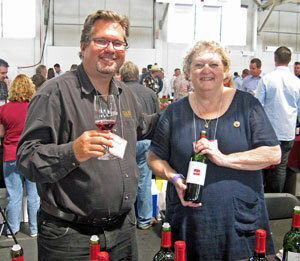 John Westerhold was on hand at the tasting as well as Russell and his assistant Kimberly Hatcher.